b. It is a porpoise. It spends its days swimming, eating, and pondering the meaning of Dermot O’Leary’s success in an ever-declining world. Voted Top Porpoise by the NME in 1947, this natty creature has been involved in the Frinton Amateur Choral Society for some time, although its total inability to sing has meant that they always put it right at the back. 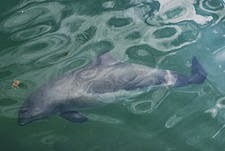 This has upset the Porpoise to such an extent that it often emits a low, depressed bark, resulting in it being placed even further back. Never mind, Frinty, your day will come.